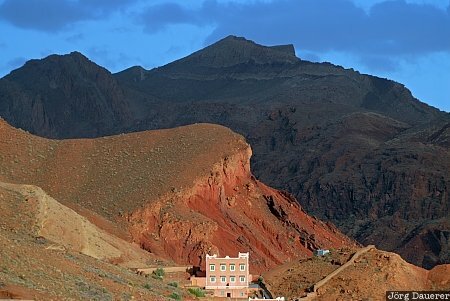 A lone house built in the local Kasbah style below the red rocks of the Dadès Gorges (valley) illuminated by warm evening light below a dark sky. The Dadès Gorges is in Souss-Massa-Drâa in the east of Morocco. This photo was taken in the evening of a sunny day in March of 2010. This photo was taken with a digital camera.